Michael survived the AIDS epidemic without infection and died on his own terms, by his chosen vices of cigarettes and alcohol, but the toll the disease on him was inescapable. As with most gay men of his generation, Michael lived with the regular trauma of bad news, of old friends that had learned they were infected, of seeing the obituaries and funerals of friends new and old. And, of course, he lived with and helped manage David’s HIV+ status for around 8 years. 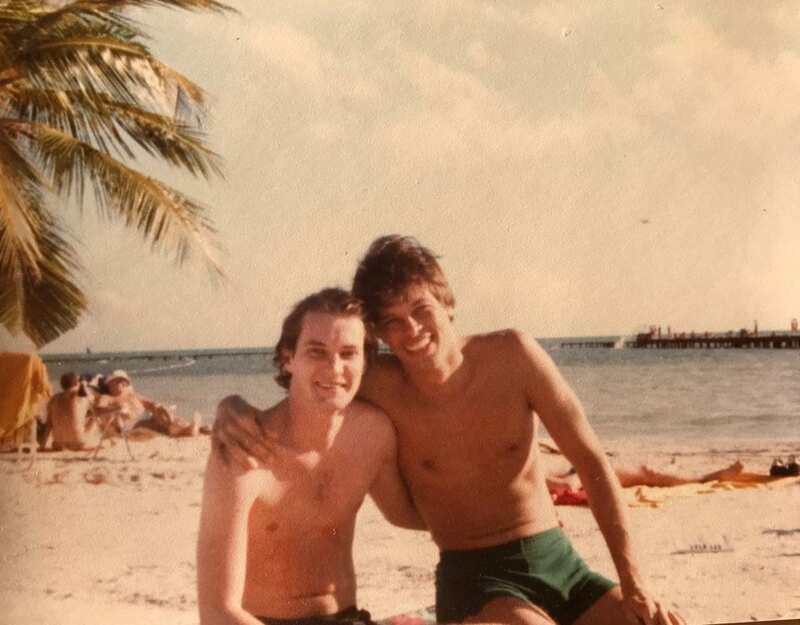 Michael and David on the beach, I would guess Key West in the ’80’s. Harvey Milk wrote “If a bullet should enter my brain, let that bullet destroy every closet door in the country,” understanding the role tragedy played in gay liberation. AIDS had an analogous effect, forcing hundreds of thousands of gay men to reveal themselves to friends and family: soon people in every demographic group in America knew someone close to them was suffering the trauma of the disease. It was an important part of the sudden and profound shift in American attitudes towards LGBTQ people. The collective sorrow and mass outing of gay men across the country created a fraternity of common experience and grief, and an ever-shrinking group of men who had lived through it all. The twenty-seventh poem in Cape Cod Light is Happening to See You Again, about meeting an old, pre-crisis acquaintance after many years. The title is much lighter than the content of the poem; indeed it is facetious: this man has sought Michael out for closure of traumas past, not randomly bumped into him. Michael once told me that he got a phone call from a fan of his poem, which first appeared as Occasion for Poetry in Bay Windows (now The Rainbow Times). Michael had a long discussion about why it resonated so much with the caller. Michael was disappointed when he realized that the caller was under the misimpression that Michael was describing reconnecting with an former lover, when the poem is clearly about an old acquaintance for whom Michael had very little respect, both in their youth and upon “happening” to see them again. The poem reminds me of a scene (which I probably misremember) in Single Lives, a play by Michael’s friend Sinan Ünel, in which an elderly gay man recounts visiting his decades-estranged wife to get her signature on divorce papers so he can marry his longtime partner. She had expected to be angry upon seeing him; to confront him with all of her grievances and to wield her power over him to have some revenge or closure for his wrongs. But instead she realizes he is not the angry, closeted man she remembers, but a completely different person: the decades have changed them both so much that the old arguments might as well be someone else’s. She signs the papers without incident, having achieved a different peace than she had imagined she would. For all the things I didn’t do to you twenty years ago. So much that’s remembered never happened. Decked with lazy afternoons, and long nights festive at the bars. And dream of a world without disease on the beaches of California. I know why you seek me out. How many of us from those days are left alive? As if the imagined slights happened yesterday. Carefully scabbing the scars of future tears? This entry was posted in Uncategorized on February 17, 2019 by jtw13.